Currently, MonoDroid (Mono for Android) doesn’t support native libraries (or any other Android resource type) in library projects (bug report). Fortunately, they support normal .NET assembly resources. This led me to write a workaround for this missing feature. Here’s the class that implements to loader. 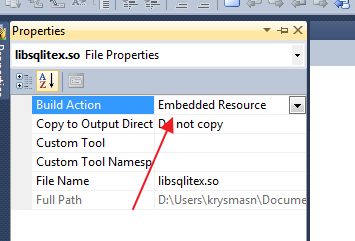 Then select “Embedded Resource” as Build Action in the file’s properties (Hotkey: F4). Note: If you renamed the directory “NativeLibs” from above, you can specify it as third parameter for Load().